Hover over each step to read more information. Use our easy booking form to reserve and pay for your car parking. On the day of your flight, bring your car to 14 Airpark Drive (Heartland Hotel Auckland Airport) and park in the short term parking area outside of Hotel Reception. Let Hotel Reception know that you have arrived and present your confirmation email. You will be given an Access Card and parking permit. Park your car. Place the parking permit on your dashboard and store your Access Card in a safe place. Return to Hotel Reception to get on the airport shuttle. 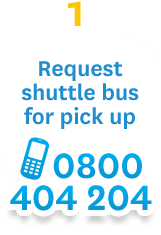 Once you’ve returned and collected your luggage, please phone the shuttle driver (0800 404 204 or via the i-Site courtesy phone) to request a pickup. Proceed to the shuttle waiting area. A Heartland Hotel shuttle will pick you up within 15 minutes and take you back to the car park. Locate your car and drive to the gate. 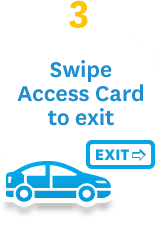 Swipe your Access Card to exit. Use our easy booking form to reserve and pay for your car parking. You’ll receive a confirmation email from us with the details of your car parking reservation. Please print the confirmation email and present it upon arrival to speed up the process. On the day of your trip, you should plan to arrive at our car park 30 – 40 minutes before you are due to check-in at the airport. The car park is located at 14 Airpark Drive (Heartland Hotel Auckland Airport). When you arrive, park in the designated short-term parking area just outside the Hotel Reception entrance. Let Hotel Reception know that you have a car parking reservation. You will be given an Access Card and a parking permit to display on your dashboard. Drive your car to the parking entry gate and swipe the Access Card to gain access through the boom gate. The entry gate is approximately 30m away from the Hotel Reception. Park your car according to the map illustration provided in your email confirmation and place your parking permit on your dashboard. 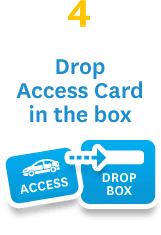 Drop the access key in the drop box provided at the boom gate entry. Now return to Reception (2-minute walk) to wait for the next available airport shuttle, which departs every 30 minutes (on the hour and half hour) between 4am and 9pm and after hours as requested. 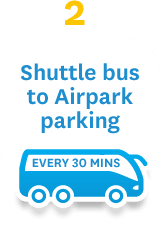 Please note that the Shuttle Service is used by both Airpark customers and Hotel guests. This means that waiting times may be longer than expected. That’s it – enjoy your trip! We’ll see you when you get back. Welcome back! Hopefully, your flight is returning at the planned time. We try our best to keep up to date with delayed flights, but we request that you phone Hotel Reception (+64 9 280 0470), if possible. Important note: If your flight has been delayed, you may need to pay an additional amount. Please settle your account at Hotel Reception so your Access Card can be updated. Once you’ve returned from your trip and collected your baggage, go to the i-Site office in the Domestic or International Terminal. Please use the courtesy phone provided at the i-Site or phone Heartland Hotel Reception (0800 404 204) to request a pickup by our Airpark shuttle. Proceed to the shuttle waiting area. For domestic flights, the shuttle stop is outside Door 7 near the pedestrian crossing. For International arrivals, the shuttle stop is located outside of Door 11 towards the right. A shuttle marked ‘Heartland Hotel’ will pick you up at the advised approximate time. Once at the Hotel, please report to Reception to check the car out. If your flight was delayed, there may be an outstanding fee to pay. You will need to settle this with Reception before leaving so that your Access Card can be updated accordingly. You may then proceed to the car park to collect your car. Locate your car and drive to the exit gate. Swipe the Access Card to lift the boom. Place the Access Card in the box provided at the gate. If you have any questions, please refer to our FAQ section. You may also phone or email us – we’re always happy to help!